It's time to start gearing up for all the shopping madness that's going to be going on this weekend. 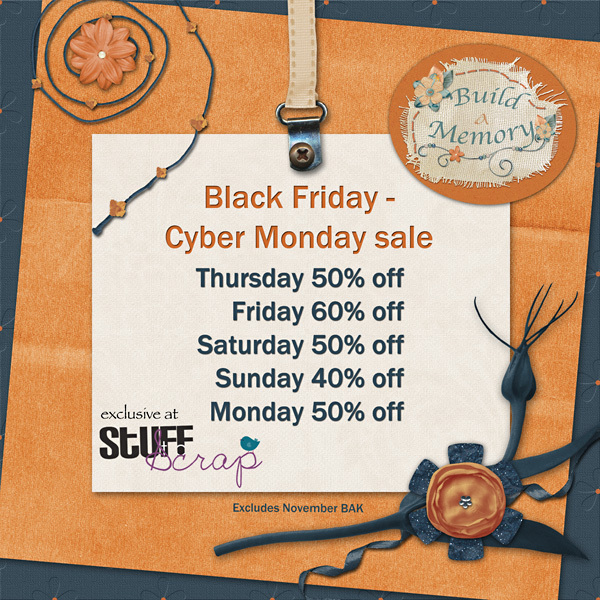 Many of the designers here at Stuff to Scrap will be having sales for Black Friday, Cyber Monday & even today on Thanksgiving! I'm going to be a stinker & only tell you who's having a sale but I will also tell you that the sale prices will be changing all weekend so keep your eyes open for the best deals. And the best part? No sitting outside in the freezing cold or dealing with the shopping masses! Below is a list of the designers having sales, savings will be valid each day from midnight to midnight but be warned, once the clock strikes 12 all the prices will change! Keep in mind these are just the sales I know about, some of the other designers may be having sales going on as well so check out the rest of the store while you are there. Please note that the sale prices will not be valid on current November BAK packs. Happy shopping!